The Paul Smith outlet store in London may have a swanky Mayfair address but you'll find bargains galore inside this discount shop. The brand doesn't actively promote the shop so it's semi-secret and retains an air of exclusivity. The small shop was originally the second Paul Smith store in London. The store stocks primarily menswear, but from time-to-time has womenswear, children's' wear, home decor items, and accessories from the iconic British designer. The items are either samples or are from previous seasons and you can expect to save between 30 and 50 percent. Paul Smith, born in 1946, opened his first store in Nottingham in 1970 called Vetement Pour Homme selling primarily classic men's clothing. The designer is now known for his quality tailoring and his authentic British style combined with modern touches. He calls it, "classic with a twist. Some of his "twists" are eccentric and intriguing, but not entirely over the top. His line includes clothing, shoes, and accessories. Originally interested primarily in professional cycling, Paul Smith's interests turned to fashion after an accident where he spent six months in the hospital. He retains his passion for bicycles, though, and In 2016, his second book, Paul Smith's Cycling Scrapbook was published, which describes the history of the sport he loves. Over the years his brand has expanded into over 70 countries and is found in stores, boutiques, high-end department stores and even shops in airport terminals. Paul Smith garments are sold online through his company's website. Paul Smith has unique stand-alone boutiques including the familiar hot pink flagship store in Los Angeles on trendy Melrose Avenue. Smith was made a Royal Designer for Industry in 1991 and was knighted by Queen Elizabeth II in 2000. He's had two exhibitions at the Design Museum dedicated to his work. This London shop, while iconic, is not the only place you can purchase his designs at a bargain price. His other outlet stores are found in outlet malls and shopping centers such as the Simon and Premium Outlet Malls. Paul Smith is a global brand with 20 collections including Paul Smith Women, PS by Paul Smith, Paul Smith London, Paul Smith Accessories, Paul Smith Jeans, Paul Smith Watches, and Paul Smith Pens. Outlets are places where things that are not sold or are over-produced, find a home. And if you are persistent, you'll find a bargain or two. 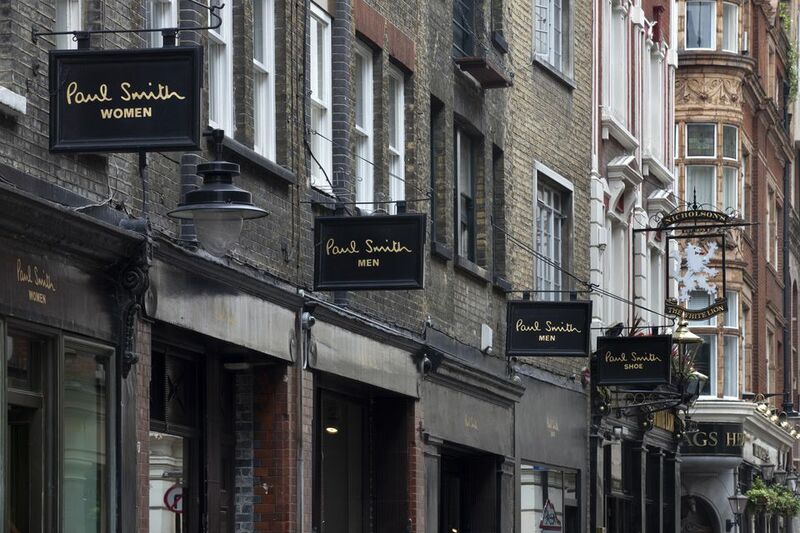 The Paul Smith outlet store is located at 23 Avery Row, London W1X 9BH. The shop is close to Bond Street and is open seven days a week. To get there, use Journey Planner to plan your route using public transport. While in the area, you can shop some more at the trendy Bond Street stores. Swiss watchmaker OMEGA has a Bond Street boutique selling both men’s and women’s watches, as well as accessories like fine jewelry, leather goods, and colognes.